It’s Easter and the wattle is starting to blossom in Fremantle. It’s a brilliant morning that does not deserve or require negativity and it is a special and important day for Christians, so let us celebrate life instead of finding an excuse for attacking our Muslim brothers and sisters, as a columnist in the Sunday Times today does. Religions are important and valuable for those who believe in their gods and who gain strength from it and it is not up to anyone to judge people because of their religion. It is so irrelevant if some Muslim women don’t shake hands with men as culture, tradition and religions are all different. I have been to countries where I was told not to touch children on their head because of culture or religion. No big deal. When I arrived in Australia 35 years ago it was the norm for men to shake hands with men but not with women. I never embraced that practice because I was brought up in the Dutch culture of shaking hands with men and women, but it never was a big deal, just different and for me slightly awkward to observe. Many religious traditions have over hundreds of years become more cultural traditions with people often not knowing what it is we celebrate. How many of us will reflect today on the biblical Christian belief that Easter is about the resurrection of Jesus Christ who was nailed to a cross? This is very meaningful to all Christians but pretty meaningless to other religions and non-believers. No big deal. Easter eggs and Easter bunnies have probably very little to do with Jesus Christ, but that is not a big deal either, as long as we all try to live peacefully and with mutual respect for each other. This weekend is perfect to celebrate our great Australian multiculturalism and the acceptance of all different religions, cultures and traditions. When you walk around the Fremantle International Street Arts Festival the next two days that is what you will be witnessing; people living together in near perfect harmony. Time to get you all in the mood for Easter, the long weekend, some reflection for the believers, and a lot of fun to be had at the Fremantle STREET ART FESTIVAL. 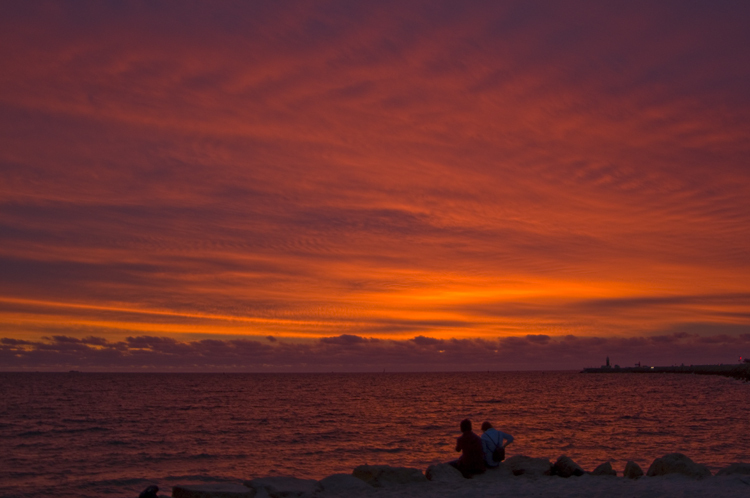 There was this beautiful sunset at Bathers Beach last night while we were having the end party of Sculpture@Bathers a the eclectic Kelp Bar at Kidogo Arthouse with live music by Dom Mariani. KELP is such a lovely addition to the Freo bar scene that it will hopefully open permanently in the future. Everyone who has been there loves it. Most sculptures have left now, but for that lonely salt figure in the ocean, that was created by artist Simon Gilby. It will slowly disappear as the elements erode the salt structure and only the skeleton will be left, reminding us of life where we start as perfect babies, grow up and then slowly deteriorate until we die. It is a thought provoking piece of art that I love looking at while contemplating life. 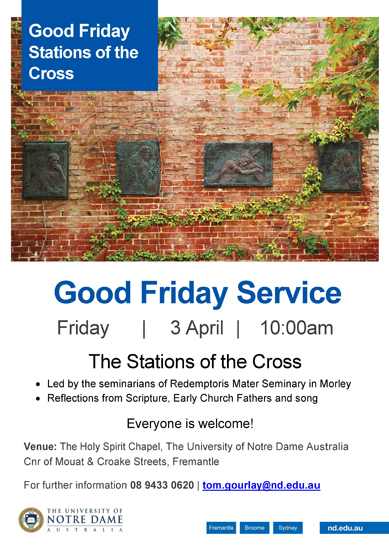 Here some information for my Catholic friends around Fremantle about Notre Dame University Easter events. On Thursday there will be “An hour of Eucharistic Adoration” in the Molloy Courtyard at 12.30 pm. There will be music by UNDA’s own Holy Spirit Choir and priests will be at hand to give the Sacrament of Reconciliation. On Good Friday the “Stations of the Cross” will be at the Holy Spirit Chapel on the corner of Croke and Mouat at 10 am. Of course everyone is welcome!